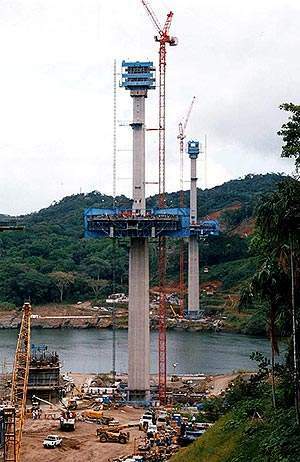 The completed Puente Centenario (Centennial Bridge) Panama Canal road crossing in August 2004. 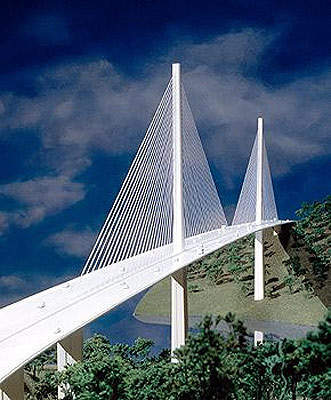 The new Panama Canal crossing is a cable-stayed bridge carrying six lanes of traffic. Two tapering 184m towers support a single plane of cables. The second Panama Canal crossing is located 15km north of the first bridge, Puente de las Americas. The design of the Puente Centenario conforms to the AASHTO standard specifications for highway bridges and AASHTO guidelines for segmental concrete bridges. Built in 1962, Puente de las Americas (Bridge of the Americas) was the only road crossing point of the Panama Canal. When it first opened, 9,500 vehicles crossed the bridge daily; in 2004 this number reached 35,000. Carrying the Pan-American Highway, congestion across this existing bridge has prevented an efficient flow of traffic. 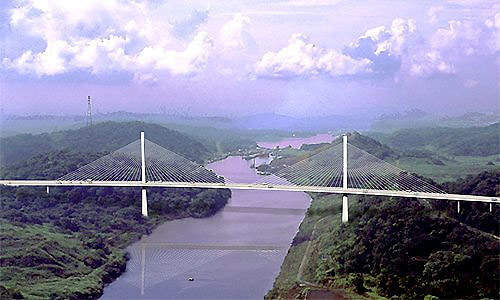 In response to this the Panamanian Ministry of Public Works invited consultants to submit design concepts for a second canal crossing in October 2000. A contract for the Puente Centenario (Centennial Bridge) was awarded in March 2002 to complete the bridge in just 29 months, in order that the first crossing of this new bridge will coincide with the 90th anniversary of the very first ship journey through the canal (the US cargo ship Ancon, on 15 August 1914). The second crossing is located 15km north of the Puente de las Americas, close to the Pedro Miguel locks and Paraiso community and 22km from Panama City. The bridge, along with new freeway sections connecting Araijan in the west to Cerro Patacon in the east, is expected to remove 50% of the traffic from the old bridge. The new bridge was designed by a joint venture between TY Lin International and the Louis Berger Group Inc, for which the consortium was awarded $2.8 million. Bilfinger Berger AG (Germany), working with Australian subsidiary Baulderstone Hornibrook, were the building contractors and completed the project in just 27 months. COWI Consulting Engineers and Planners AS won a contract worth over DKK50 million for project management, design checking and construction supervision. Structural and construction engineering contracts were awarded to Leonhardt, Andra and Partner. Freyssinet International was the cable subcontractor, and URSSA was the steel fabricator. The new Panama Canal crossing is a cable-stayed bridge carrying six lanes of traffic (two carriageways of three lanes) across the canal. The bridge has a total span of 1,052m with a main span of 320m and 80m of vertical navigational clearance to allow large vessels to pass through safely. Two tapering 184m towers support a single plane of cables. The concrete superstructure consists of a single box with cantilevered concrete ribs. Approximately 66,000m³ of concrete, 12,000t of reinforcement, 1,400t of stays, 700t of post-tensioning, 1,000t of structural steel and 100,000m³ of earthwork were required during the project. A floating crane, called Titan, is permanently stationed in the canal to be used for rescue services, repairing lock gates, etc. 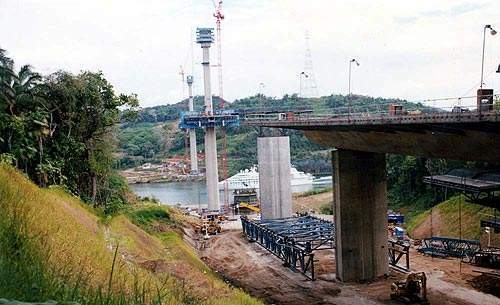 Since this machine needed to be able to pass under the new bridge, sufficient clearance was necessary, hence the unusually high vertical clearance. Titan is one of three cranes that was originally built in Germany and taken to the US after World War II; it has been deployed in the Panama Canal ever since. Design of the Puente Centenario conforms to the AASHTO standard specifications for highway bridges and AASHTO guidelines for segmental concrete bridges. 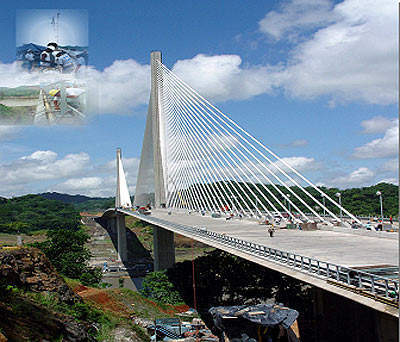 Seismic activity is frequently observed in the Panama region and the bridge is designed to withstand earthquakes (peak ground acceleration of 0.21g and 0.33g for functionality evaluation earthquake and safety evaluation earthquake respectively). Aesthetic lighting illuminates the towers at night, making the bridge a focal point in an otherwise dark rainforest setting. 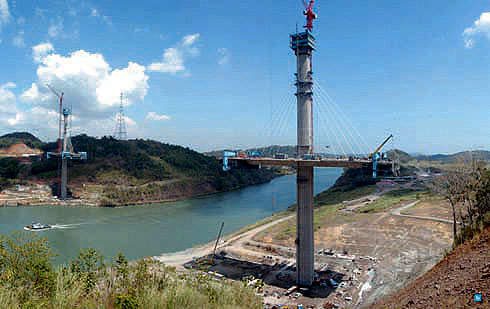 On schedule, the official inauguration of the bridge took place on 15 August 2004. The Puente Centenario bridge project is being funded by the Panamanian government. The total cost of the project is estimated at $120 million. A loan of $50 million was provided by the European Investment Bank (EIB) to the Republic of Panama. This 20yr loan has a 5yr grace period, and is guaranteed by the budget of the European Union. In 1999, the US Trade and Development Agency awarded $800,000 in grants for two feasibility studies on projects related to the Panama Canal. $400,000 partially funded a $634,000 feasibility study for the construction of a new bridge. The US Trade and Development Agency is an independent federal agency that assists in the creation of jobs for Americans by helping US companies pursue overseas business ventures. US exports associated with this project (cranes, hoists, construction materials, steel, earth moving equipment, electronic tolls, etc.) could, the agency believes, exceed $43 million.